Introduction: In 1993, Delvaux et al reported that he could remove the GB and a large GB stone through transvaginal route after laparoscopic cholecystectomy in female patients. Recently, natural orifice extraction (NOE) has been extensively performed after totally laparoscopic nephrectomy and totally laparoscopic colon resection. However, there have been no report of NOE after subtotal gastrectomy in gastric cancer. We report herein a case of transvaginal specimen extraction after totally laparoscopic subtotal gastrectomy in early gastric cancer. Case: A 58-year-old woman was admitted to the local clinic in order to evaluate abdominal pain and diarrhea, and she was diagnosed with early gastric cancer by a gastrofibroscopic examination and biopsy. She received oral hypoglycemic agents 8 years ago. When she was transferred to our hospital for surgery, we performed gastrofibroscopy again and identified a small R/O EGC type IIa+IIc lesion in the lesser curvature. We performed totally laparoscopic subtotal gastrectomy and D1 + β lymph node dissection through 5 trocars (two 11-mm, one 12-mm and two 5-mm) and reconstruction with the Billroth II method (gastrojejunostomy; antecolic, antiperistaltic type) using endo–GIA 60(ENDO GIA universal straight 60 3.5, Covidien, Messachusetts). The insertion site of endo-GIA was repaired using intracorporeal interrupted sutures with PDS 3-0 (PDS II, Ethicon, Inc., New Jersey). Posterior Colpotomy was performed by an experienced gynecologist (W.-J.C.), who retrieved the specimens in a LapBag through the transvaginal route. We promptly repaired the colpotomy sites after specimen removal. The hemoglobin level decreased 3 days after surgery. Postoperative CT scans exhibited an intra-abdominal hematoma around the operative site after surgery without active bleeding. The patient was ordered to be in absolute bed rest, and she was transfused with 3 pints of red blood cells. After transfusion, there was no change in hemoglobin concentration. A diet was started 5 days after surgery, and she was discharged 10 days after surgery. Pathologic examination confirmed adenocarcinoma in the mucosal specimen. During 3–month follow-up, she did not have any problems at the operative and colpotomy sites. 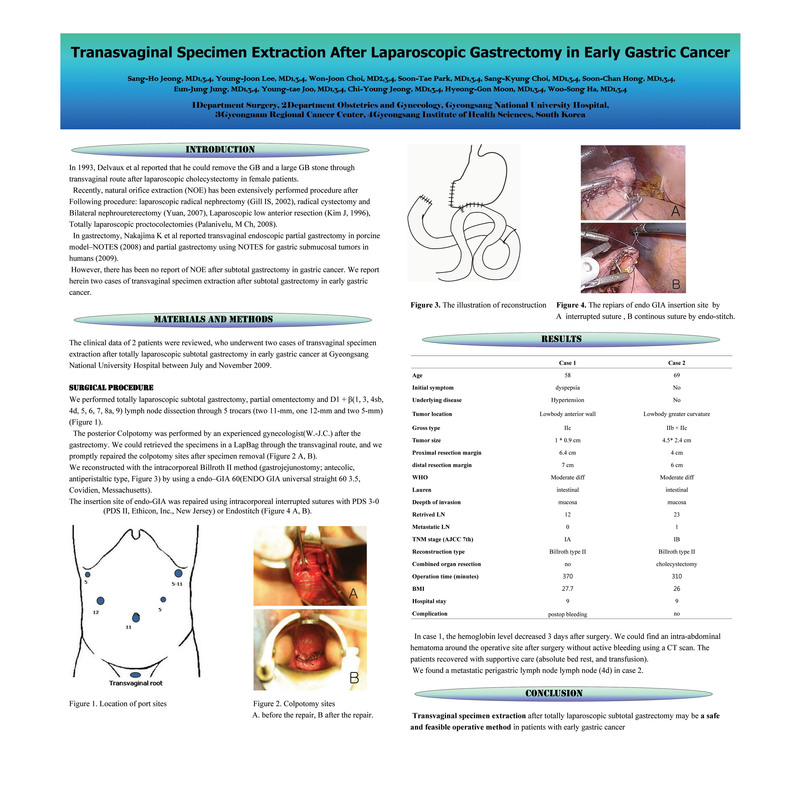 Conclusion: Transvaginal specimen extraction after totally laparoscopic subtotal gastrectomy may be a safe and feasible method in patients with early gastric cancer.